One reality of the world we live in is how a family’s standard of living shines a spotlight on the father. Whether a family is living the high life or barely scraping by, we take our observations and automatically make assumptions about a father’s success (or lack of it) in the workplace. And while fathers have always been under the microscope this way, the pressure is worse today because we’re a wealthier, more materialistic society than previous generations. It’s not just the upper-class enjoying luxuries – it’s the middle class, too. Big homes, fancy vacations, and designer clothes for the kids are norms in many communities. While it used to be enough for a father to meet his family’s needs, he’s now expected to meet their every want, too. The problem with wants is that they’re never enough to satisfy us. The more we have, the more we need, and after a while, the line between our wants and our needs gets blurred. Considering this culture, it’s easy to see why families are deeper in debt than ever. Why the mid-life crisis for men is typically career-related, and not being as far advanced as they expected to be. Why a job loss can wreak havoc on a man’s ego. Why husbands and wives argue over the work-home balance. A wife wants her husband to provide nice things and be home by five o’clock; he counters by saying that making more money requires longer hours at the office. But even in this environment, there is hope, hope that begins when a father realizes that work is not his identity. His worth is not his salary. As children of God, we’re all born with as much worth as we’ll ever have. Our worth is inherent, so no matter what we do, or how high our salary climbs, our worth remains the same. So for all you fathers out there, working hard to be the breadwinner, don’t think you’re only as good as your status symbols. Don’t get so caught up in creating a legacy at work that you neglect your legacy at home. Most of all, don’t compare yourself to other dads. Blessings come in many forms, and just because someone has a bigger roof over their family’s head doesn’t make them superior. What he does is tickle me, and hug me, and tell me how much he loves me; what he does is swell up with pride when I do something great; what he does is work hard even though he’d rather be playing with me; what he does is take care of our family, keep us laughing, and calm my mother down when she’s losing it. Yeah, my dad’s awesome. But enough about him. 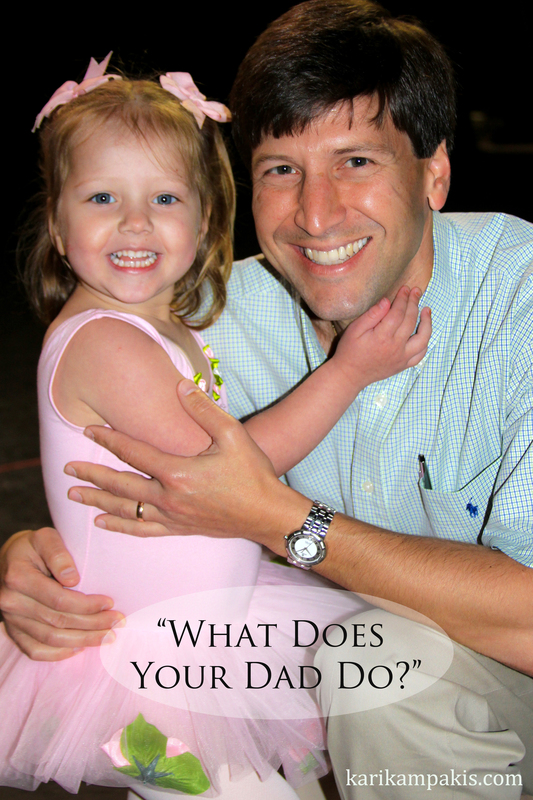 What does your dad do? To me that’s an answer a father should aspire to. That’s an answer that’s better than any career achievement and guaranteed to leave a friend gaping and green with envy. 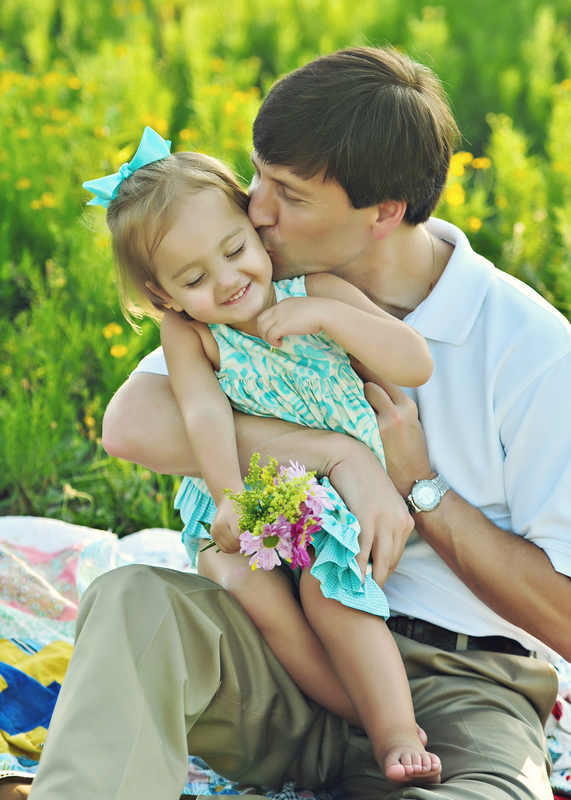 It is what a father does at home – not the office – that makes them a great parent. So to all you daddies loving your children wholeheartedly, keep at it. Engage in their lives and reap the rewards. Thank you for your sacrifices, selflessness, and commitment to family. I can’t imagine the pressure of being a breadwinner. Sometimes, when I think about it, I gain a whole new respect for men. I’ve been blessed and inspired by many wonderful fathers (my husband, father, brother, and father-in-law included). While it takes all kinds of dads to make the world go ’round, what the good ones have in common is a passion for their loved ones. It’s not their paycheck they’re known for, but how closely they pay attention to what matters. When a man does that, he’s a hero in my book.